Driverless cars aren’t yet available to the masses, but that day isn’t far off. Sounds exciting? Maybe not yet. A recent survey from the University of Michigan polled more than 600 drivers and found that only 15% were in favor of self-driving cars. About 46% said they prefer cars without any automated driving capability, according to the research by Brandon Schoettle and Michael Sivak. Driverless cars may not be a rare sight for long. Industry analyst IHS Automotive expects that the first several thousand will be sold in the U.S. in 2020. And by 2035, more than 75 million driverless cars will have hit the streets globally, potentially leading to far fewer car accidents and even cheaper car insurance rates — up to 30% lower, according to a report from Deloitte University Press. Is that enough to transform us into nondriving enthusiasts? Maybe not yet. But public unease could turn into acceptance — and ultimately dependence — faster than you might think. Driverless car fears at a glance: How worried are we? 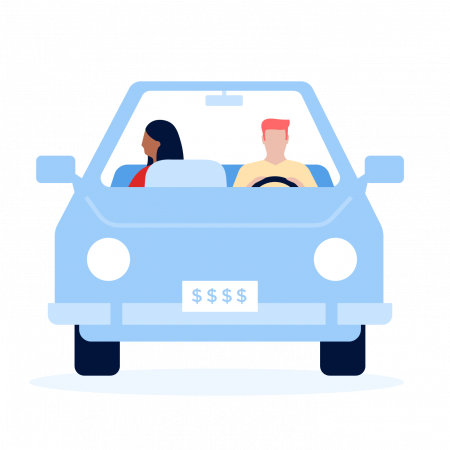 To gauge people’s openness to this landmark shift in transportation and to the degree of vehicle automation, the University of Michigan study asked survey respondents to rate their level of apprehension about riding in a completely driverless car. Here’s what they said. In large part, the fear of driverless cars stems from an inability to trust a machine over one’s own instincts. An overwhelming 94% of respondents wanted to have the option in a self-driving car of taking control with a steering wheel plus gas and brake pedals. The impulse to keep powerful technology in check is understandable. But the idea of overriding the self-driving functionality sounds better than it is. After all, humans don’t have a sterling track record themselves when it comes to decision-making on the road. “A strong case can be made that driverless cars without human controls are actually safer,” Light says. Indeed, if certain projections hold true, it would appear humans can’t get out of the driver’s seat soon enough. Research and consultant group McKinsey & Co., for instance, says vehicle crashes are expected to go from being the second-most common cause of accidental death to ninth by the middle of this century, thanks mainly to driverless cars. Even if we wanted to take over the wheel, knowing when to intervene would be difficult in real time, Light says. Say you’re watching a video on your phone while your car is humming along. If trouble occurred, you’d have only a split second to re-engage, assess the problem and try to avert danger — and in doing so, you likely would prevent your car’s computer from doing a better job. What does this early apprehension mean for the ultimate success of driverless cars? Not a heck of a lot, if history is any indication. Odds are that driverless cars are the latest in a long line of innovations that take time to become popular. “In 1994, people were terrified of the internet,” Light notes with a chuckle. Now, imagine your life without it. Or consider the airplane. Most people initially viewed the idea of flight as dangerous and crazy. Now, we get on planes without much thought — and pay even less heed to the autopilot that does most of the flying. If you want a reminder of how stubborn humans can be in the face of change, look no farther than your own garage. There, Light says, you’ll find a certain automotive invention that initially was even more widely rejected by consumers: the internal combustion engine. Most folks — and all horses — have since come around. For now, the sheer oddity of driverless cars makes the concept tough to embrace. Once these vehicles hit the streets in large numbers, however, their expected effectiveness and safety record likely will sway all but the most passionate of gearheads.